Isshin-Ryu Karate was developed in the late 1940's and early 1950's by Grand Master (G.M) Tatsuo Shimabuku. During this time Grand Master Shimabuku evolved Isshin-Ryu from the information he acquired from the different karate styles he studied. At the same time, many of the students he was training were United States military personnel. These students returned to the United States at different times in the evolution of Isshin-Ryu, so it is no wonder that variations in Isshin-Ryu exist today. There are several different film records that were made during Grand Master Shimabuku's various visits to the United States. These show that G. M. Shimabuku, never one to be confined by tradition, was continuing to develop his karate system. 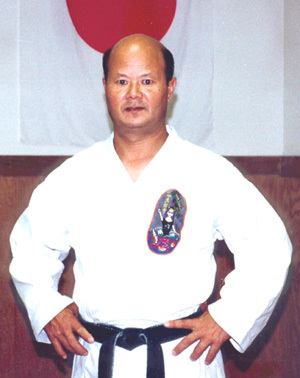 Grand Master Tatsuo Shimabuku studied kumite under Master Motobu Choken and Goju Ryu Karate from Master Chojun Miyagi. From the Goju style, Isshin-Ryu derives what are called the "hard" forms such as Sanchin, Seiunchin. From Shorin-Ryu Karate, Grand Master Shimabuku modified such kata as Seisan, Naihanchi, Wansu, Chinto and Kusanku for inclusion in his Isshin-Ryu System. It should be noted that G.M. Shimabuku substantially modified all these kata compared to how they were performed in the original styles. Weapons kata were added to Isshin-Ryu Karate from G.M. Shimabuku's training with Master Shinken Taira. To complete his Isshin-Ryu System G. M. Shimabuku developed his own kata Sunsu. In this kata, which is comprised mainly of Isshin-Ryu basics, G.M. Shimabuku demonstrates how the basics apply to self-defense. For all the kata in the Isshin-Ryu System check the kata list under the Collamer-Jones Karate Isshin-Ryu Program section. G.M. Shimabuku named his style Isshin-Ryu Karate, "The One Heart Way". He seemed to have been constantly modifying and improving his One Heart Way throughout his lifetime. Most significantly, he altered the fist position from horizontal to vertical and used a simple straight line to the target. He kept his kicks low and snapped them. Both these techniques improve mobility and decrease the possibility of a kick being blocked or trapped. G.M. 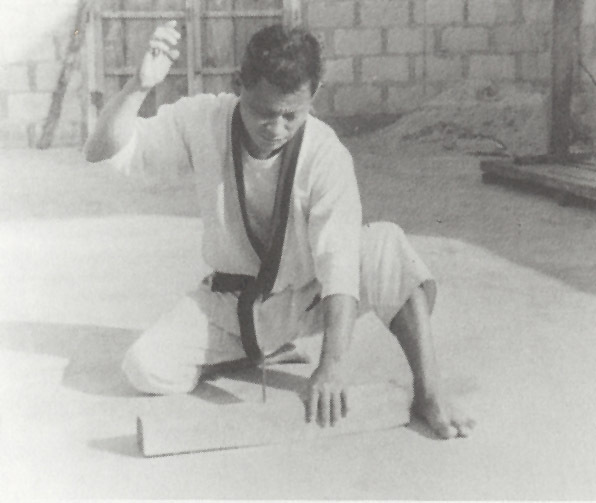 Shimabuku used the muscle side of the arm for all closed fist blocks. For basics he used combinations which included movement to Seisan stance for stability, a block which moved either into or away from the attack, and a counter or multiple counters with either an open or closed fist. For Isshin-Ryu basics check the list included in Collamer-Jones Karate Isshin-Ryu Program section. As a symbol for his Isshin-Ryu System, G.M. Shimabuku chose the Mizu Gami or Sea Goddess. The patch's oval shape represents the vertical fist which he favored for his system. 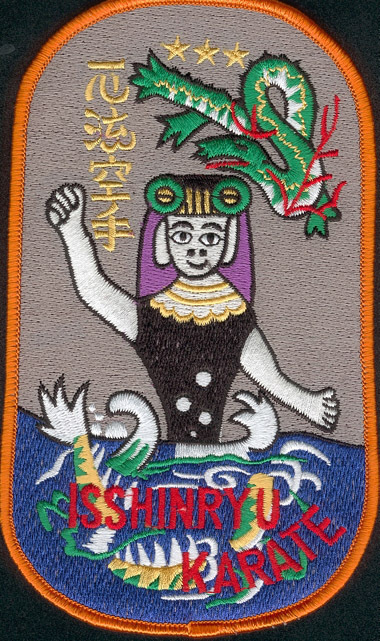 (Note: some versions of this patch are notched to show the thumb.) The gray background represents tranquility and peace, which is the ultimate goal of all karateka. The orange border represents fire, which G.M. Shimabuku envisioned in a dream. The blue water has the ability to put out the fire and represents purity. The dragon represents G.M. Shimabuku, whose nickname was Dragon Boy. Also, in ancient mythology, the dragon is born at the bottom of the sea and ascends to the heavens much as the beginner starts at that bottom and ascends to higher ranks with time and training. The three stars represent the mental, physical and spiritual aspects of karate training. They can also represent the masters who taught G.M. Shimabuku. (Note: some Isshin-Ryu patches include five stars for additional masters). G.M. Shimabuku was born in Okinawa on September 19, 1908. He died May 30, 1975. Grand Master Shimabuku entrusted his Isshin-Ryu Karate System to his son Master Kichiro Shimabuku, a tenth degree black belt. (Note: Master Kichiro's name means man of peace). Since then, Master Kichiro Shimabuku has worked to unify and spread interest worldwide in Isshin-Ryu Karate through his Isshin-Ryu World Karate Association (I.W.K.A.). Master Shimabuku has traveled often to the U.S.A. and has held IWKA Championships and Isshin-Ryu seminars at least every two years. Master Kichiro Shimabuku was born in Okinawa on February 15, 1939. He started his karate training at age six at his father's Agena Dojo. 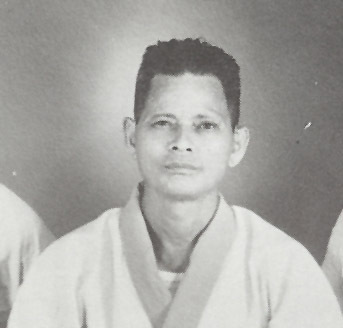 Master Kichiro Shimabuku began his first dojo at a community center and then built the current IWKA Headquarters in 1974. Master Shimabuku and his wife Yoshiko have three adult children, two daughters who are school teachers and a son who is a doctor. For pictures of the IWKA Headquarters see the Okinawa section. In 1994, Collamer-Jones Karate, Inc. was privileged to host Master Shimabuku's IWKA Championship in Rochester, N.Y. With the help of Master William Duessel, ninth degree black belt, this tournament was both large and successful. It was attended by over 550 Isshin-Ryu competitors from many different organizations, all of whom interacted smoothly with each other. Master Kichiro Shimabuku's seminar was equally well attended and all participants were impressed with both the Master's physical conditioning and teaching. 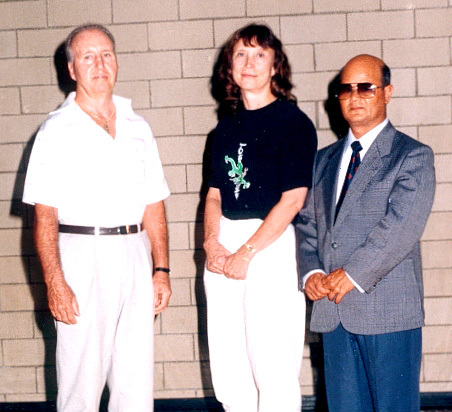 Master William Duessel, Sensei Cyndy Jones and Master Kichiro Shimabuku at Rochester, NY, tournament in 1994. In 1999, Sensei John Hughes hosted an outstanding IWKA Championship in McAfee, New Jersey. At the conclusion, Master Shimabuku and his wife Yoshiko visited Sensei Jones and her husband Tom in upstate New York. This was a fun and relaxing time for the Shimabukus after the busy tournament schedule. Of the many places visited, Niagara Falls was a special treat for Mrs. Shimabuku who saw the Falls for the first time. Both couples enjoyed the ride on the Maid of the Mist . During this visit Master Shimabuku again extended an invitation to Sensei Jones and Tom to visit him in Okinawa. This trip is planned for October, 2000.